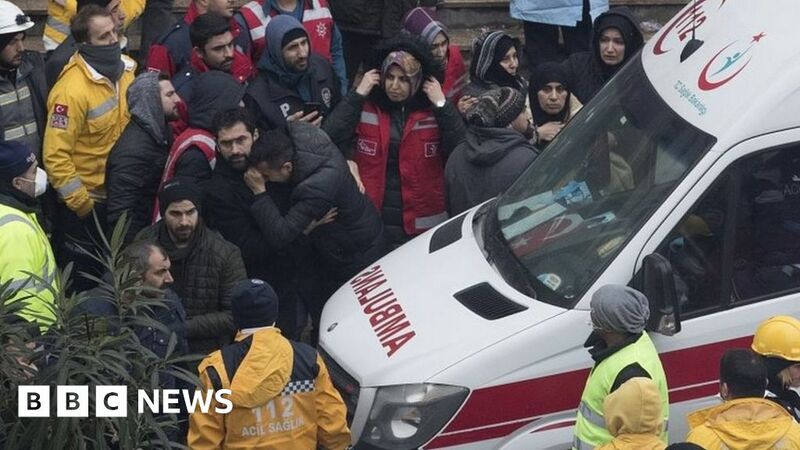 Fourteen people were killed, and fourteen others are injured when an eight-story apartment building collapsed in Istanbul, Turkey. The death toll from Wednesday's collapse has risen to 14 - as a teenager is rescued alive. 2018-11-26 A UH-1 Iroquois military helicopter crashes during a training flight in the Sancaktepe district of Istanbul, Turkey, killing four soldiers and leaving one wounded. 2018-10-31 The Turkish chief Istanbul prosecutor İrfan Fidan’s office states that Jamal Khashoggi was, with premeditation, strangled and his body was dismembered as soon as he entered the Saudi consulate building in Istanbul. This is the first such accusation against Saudi Arabia by any Turkish official. 2018-07-8 A train en route to Istanbul from Bulgaria derails in Tekirdağ Province, Turkey, killing 24 people and injuring 73. 2018-04-7 MV "Vitaspirit", a 225-meter cargo ship, crashes into a 200-year-old historic coastal mansion on the outskirts of Istanbul, Turkey after an engine failure during a voyage from Russia to Saudi Arabia. 2018-04-5 Turkish President Recep Tayyip Erdoğan calls 15 peaceful anti-war protestors arrested last month at Boğaziçi University in Istanbul terrorists and says they will not be allowed to complete their education.